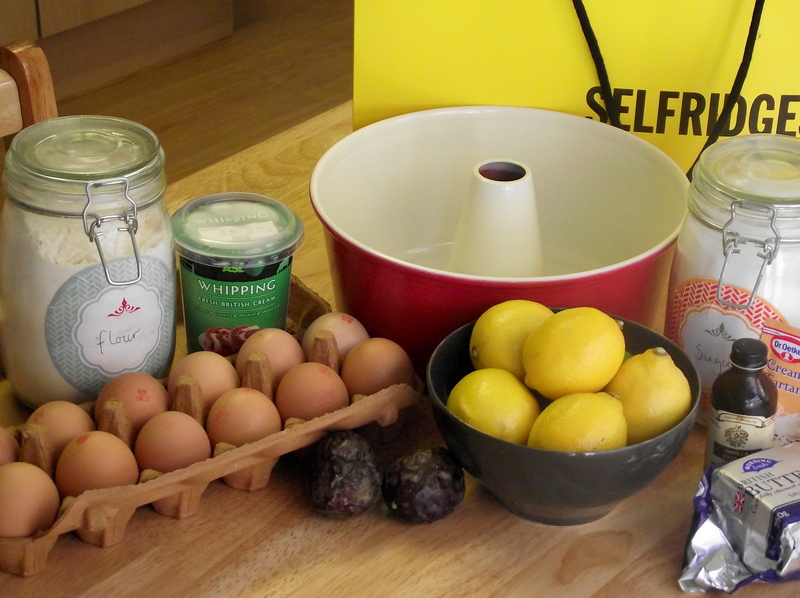 Hooray for Bake Off! The show that’s soothing yet exhilarating, inspires the nation to culinary greatness, and stops Tuesday being the worst day of the week. So far so good, although I was hasty in picking favourites who then turned out to be incompetent. My money is now on Rob, and on Howard for blossoming into the new Brendan. Such fun! This year, I plan to make the technical bake each week, because what’s the fun in doing something if it’s not difficult and you can’t feel smug about being more successful than people on TV? (Although obviously I’ll have full instructions and will be able to see where they go wrong. Still, tactics.) 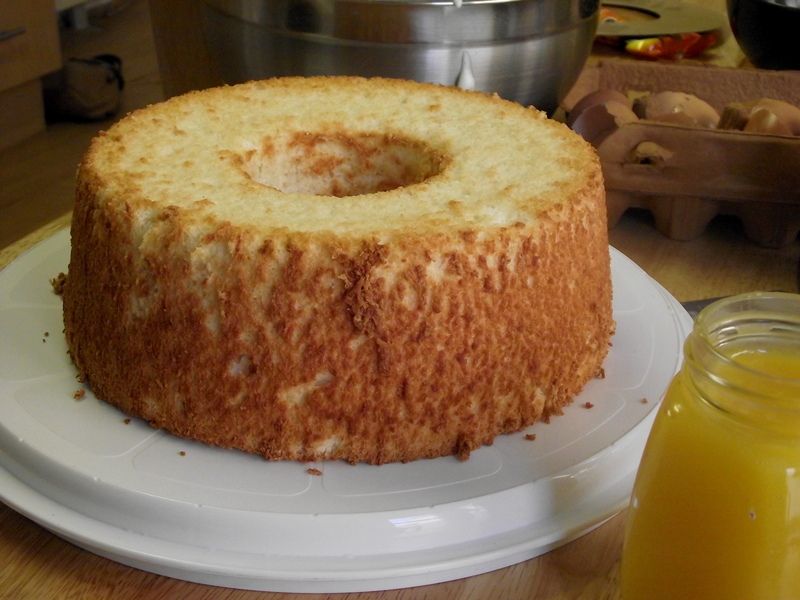 This week’s bake was angel food cake, the first challenge being to find a 10 inch tube pan that doesn’t have to be shipped from the States. Luckily Selfridges came through for me, although the expense incurred means I’ll be baking these pretty often to prove it was a worthy purchase. So, onto the recipe! Obviously I used Mazza B’s recipe for this, which can also be found here. It will use aaaalll your bowls, so be warned. I took the day off to make this, no jokes. 1. Sift the flour and 100g of the sugar into a bowl and set aside. 2. 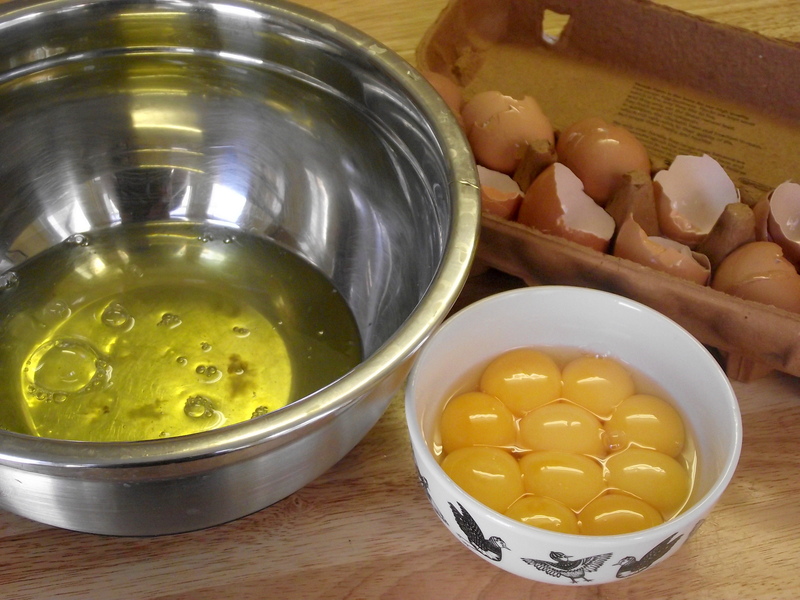 Separate your eggs very carefully, because no-one wants to ruin 9 eggs with their 10th yolk. (By this point I had managed to use 5 bowls.) 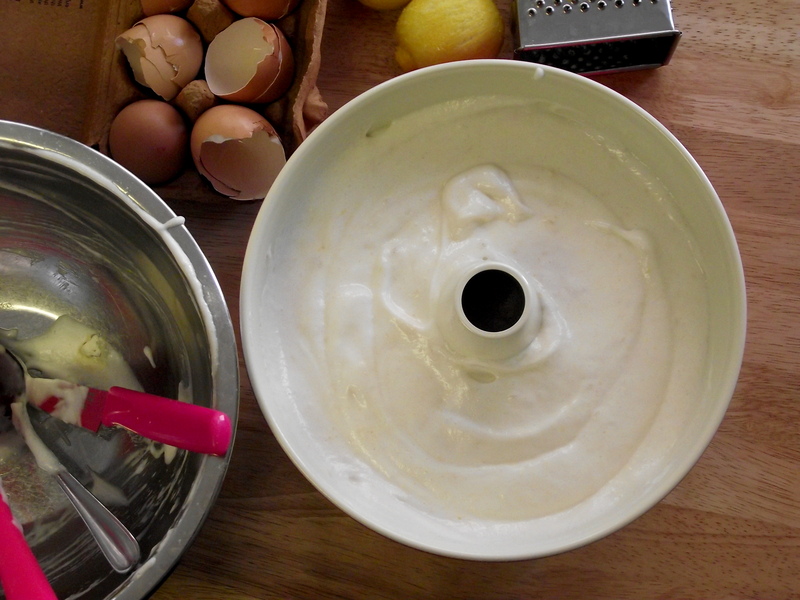 In a very large bowl, whisk the egg whites until white and frothy, but before peaks form. 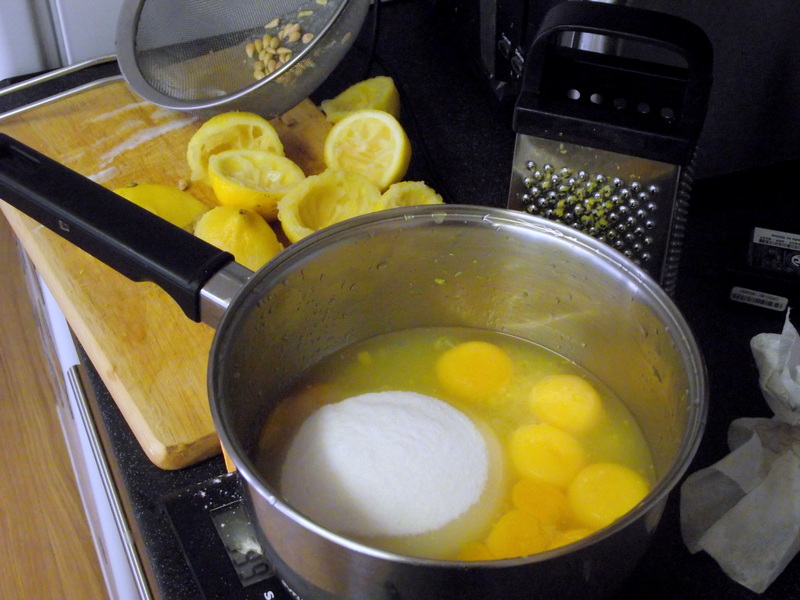 Add the lemon juice, zest, cream of tartar and salt and whisk again until soft peaks form. 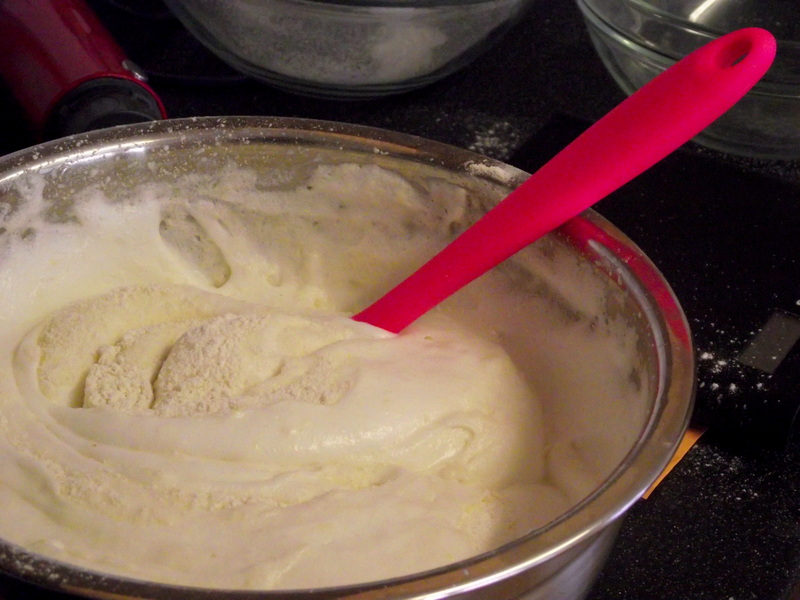 Then add the remaining sugar, one tablespoon at a time, until you have firm – but not stiff! – peaks. 3. One third at a time, gently fold in the flour and sugar mixture until combined, taking care not to beat all the air out of it. 4. 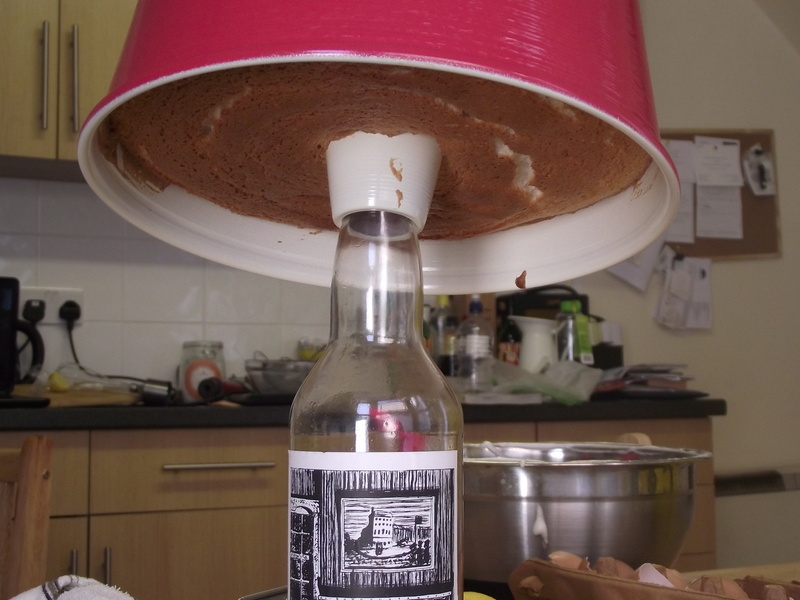 Pour the batter into an ungreased, 10 inch tube pan, and run a sharp knife through the centre to remove any large pockets of air. Bake at 180C until an inserted skewer comes out clean. This can take 45-50 minutes, although mine took just under half an hour. 5. Turn it upside down immediately to cool. If your tin has little feet then good for you, but sticking it on a bottle works just as well. 6. 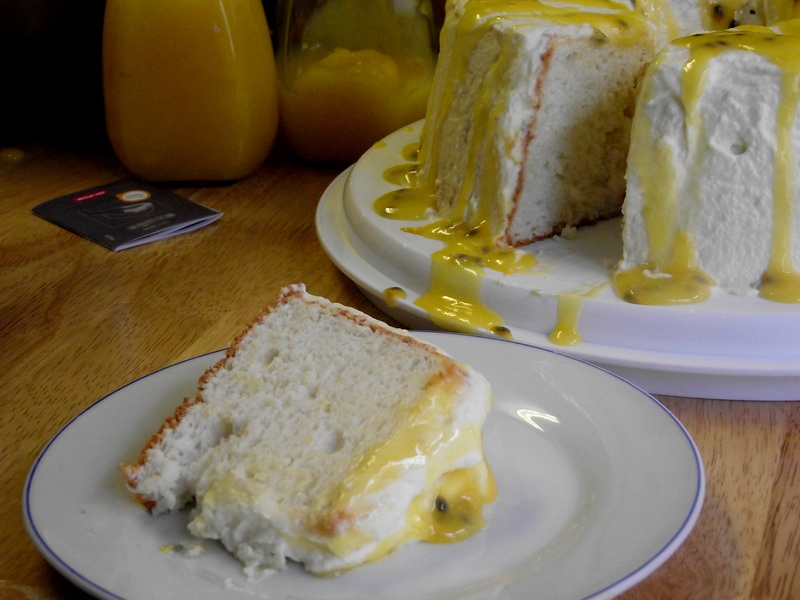 While the cake is cooling, mix the egg yolks, sugar, lemon juice and zest in a pan over a low heat. Keep stirring until the mixture thickens to coat the back of the spoon, 5-10 minutes. 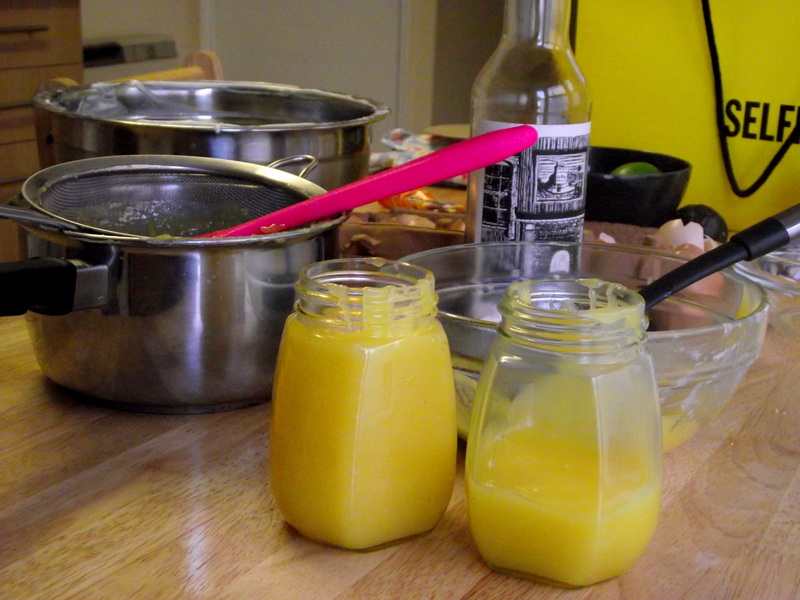 Remove from the heat, stir in the butter and pour through a sieve into jam jars, reserving a ladleful for the cake. 7. When the cake is completely cool, run a palette knife around the edge and turn out onto a plate (I had to bash mine a few times but it does fall out eventually). 8. 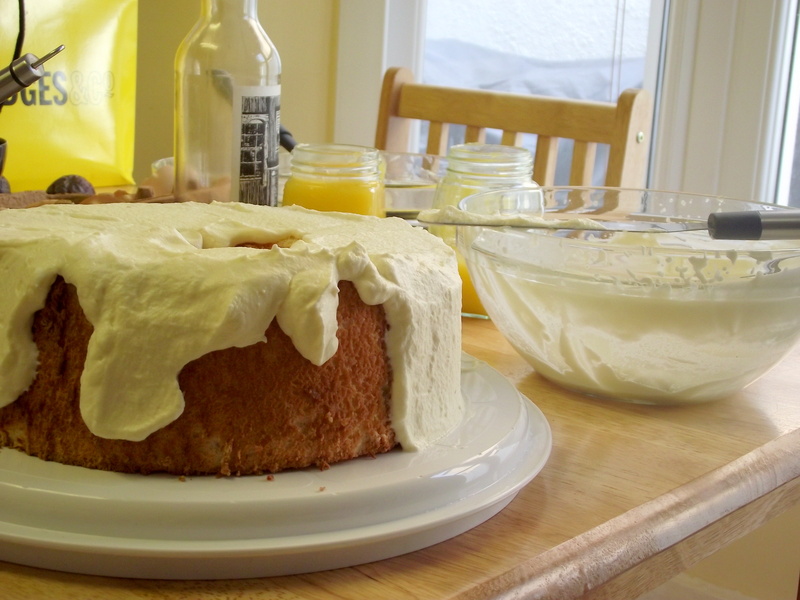 Whip the cream and vanilla to soft peaks, and spread over the cake. 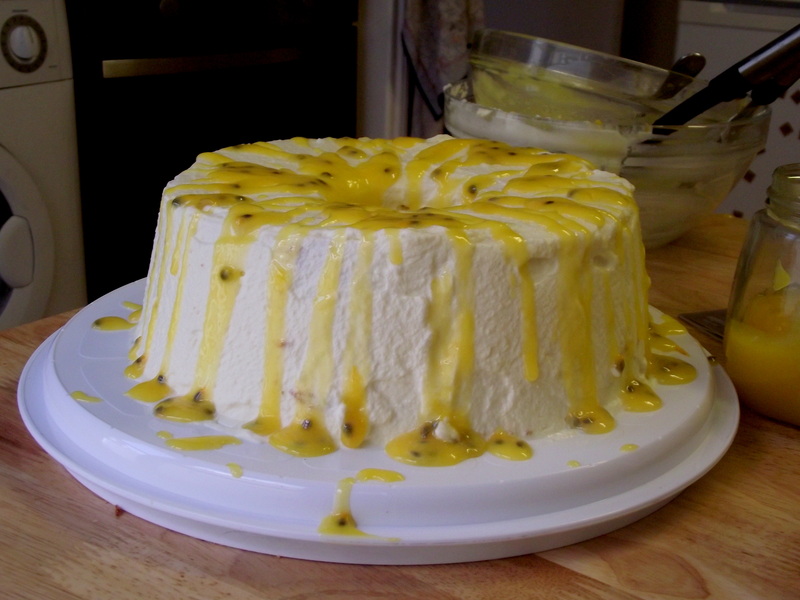 Mix the reserved curd with the seeds from the passion fruit, and drizzle over. Feel smug, and try to ignore the scenes of devastation around you. It’s a pretty messy bake. Good effort charlotte, great presentation Hail the return of GBBO! Got to love a bit of Howard, as well as Clapham, obviously.